Your auditory system is complex and encompasses your ears, a system of nerves and your brain. When sounds reach your ear, a chain reaction begins that transforms the sound waves into a signal your brain can process. To understand how hearing works, you need a good understanding of your ears’ biology. The outer ear contains the bowl-shaped cavity you can see looking in the mirror, called the concha, as well as the ear canal. This part of your ear is precisely shaped to gather sound and direct it toward your eardrum while also giving you the natural ability to determine a sound’s directionality and locality. The eardrum marks the beginning of the middle ear. When sound strikes the eardrum, it transforms into a vibration. This vibration continues to travel down the ear by way of three tiny bones located behind the eardrum, called ossicles. The first bone, located in the space behind your eardrum, transmits the sound to the second, which then sends it to the third. The ossicles are the three smallest bones in your body. 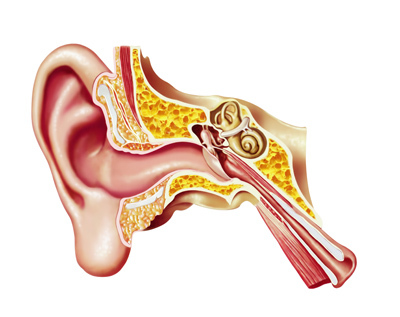 The inner ear contains the cochlea, which is a small, fluid-filled bony structure that contains the nerve receptor hair cells necessary for hearing. As the cochlea’s membrane begins moving after being struck by the third ossicle, its fluid begins flowing, moving the tiny hair cells. Different hairs of the cochlea respond to different sound frequencies. The movement of the hair cells in the inner ear transforms sound vibrations into nerve impulses. These signals then travel through the auditory nervous system to the brain’s hearing center. This is the brain’s hearing center, which translates the nerve impulse signals delivered through the auditory nerves into what you know as sound. Different types of hearing loss affect different parts of the ear. Conductive hearing loss describes conditions caused by damage to the outer or middle ear. Inner ear problems cause sensorineural hearing loss, which is the most common type. Rarely, patients can be diagnosed with mixed hearing loss, which results from a combination of conductive and sensorineural issues.